So here comes the list for november, sorry for the delay! Decision at Elst. Finally is up for preorder. Decision at Elst debuts at position 3 so all games after that go up one. One line definition Another use of the fun, easy and accesible A Victory Lost system. This time is 1945 and the Victory is Inminent. Konigsberg 1945 (K45) is a simulation of the momentous battle for East Prussia. Originally published with a very limited print run by Three Crowns Games in 2011, MMP is thrilled to bring this very well received game to a much wider audience. Konigsberg 1945 uses the award-winning game system used in A Victory Lost and A Victory Denied, but with new rules for air units, refugees, atrocities, Volksturm, and even the Admiral Hipper cruiser. This game is more than just cool parts, as Konigsberg 1945 features the classic battle between a powerful attacker trying to defeat a "fire-brigade" defense. The Soviet Army was at its peak as a fighting machine in World War Two. The German Army is but a shell of its former self, but still has several units which fought as well as any did during the entire war. Konigsberg 1945 is a two-player board game featuring a very easy to use ruleset for the veteran and is quite easy to learn for someone new to this game system. It is not an easy task, however, to overcome a stout defender or to stop an aggressive attacker! Note: Any sneak peeks or posted rules are not the final art/rules and may change slightly as this game is on preorder! Konigsberg 1945 was put on preorder March 6th, 2013. I own both AVD and AVL and I am not really a fun of either. In fact this is the only one of the games on preorder that I was not even tempted to preorder. Fun fact: AVL was the first game I clipped, the reason being that it was impossible to put the counters in the hexes, so closed to each other! Almost 50% in three months means that this game is strong. I should look into this game (although I am still not attracted to it). One line definition It is Normandy again, but using and area impulse system and it can be bundled with (French) Vietnam. June 6th 1944: American, British and Canadian forces landed at dawn on five beaches in Normandy, intent on starting the operation that would help end the war on the West Front. Storm Over Normandy simulates the first six days of the operation, with the surprise landing on the Allied forces, and the response by the German occupiers. Using the Area Move system redefined in Storm Over Stalingrad, the game features the use of cards to augment game play, adding to the tension experienced by both sides. The rules are similar in length to those seen in Storm Over Stalingrad, and are of the same level of complexity, with modifications made to represent the scale of the operation. New cards have been created in order to represent events encountered during the operation. The game focuses on the landings on the five beaches “Sword”, “Juno”, “Gold”, “Omaha”, “Utah”, plus the Allied paratrooper operations, and the German response over the first week of the battle. The game is seven turns long, and can be played in less than 3 hours by experienced players. I am more interested in Dien Bien Phu than in this game, but having the possibility of bundling them together sounds really good. Losing ground to its brother. I have a lot of Normandy games and the idea of the bundle is not good for me as it will probably mean getting hit by customs. Strong month for the bundle. Well, six more preorders at this scale is a strong month. It is like the joke "Hey, you are Antonio, I bought your book" "oh, so it was you". One line definition Market Garden +ASLSK + Campaign game + self contained. Looking forward to this game, although I should learn first to play with tanks! One line definition The Warriors of God system goes to feudal Japan for more chaos and nobles killing. The Buzz: According to Brian Youse in Special OPS 3 the game is done, waiting for its numbers. Players of Warriors of God will find much familiar here, however, unlike the enormous time period covered in Warriors of God, Warriors of Japan covers only 4 years. Subtle changes in the system to cover this unique period have been exchanged in Warriors of Japan. For example, Leaders no longer die from old age but rather can switch sides unexpectedly during a combat. Subtle changes in the movement and combat rules will add to the strategy to a greater extent than in Warriors of God. A random game start generator will keep each game fresh and interesting. The Sengoku-jidai era is one of the most fascinating eras for a war-history buff. The way innovations, religion and allegiances where used is simply enthrilling. And this game uses a tried system. But it is not about the Sengoku-jidai era, but on the Nanboku-cho period hundred years earlier! Games that steer away from MMP "traditional" stable seem to suffer a lot, still I have heard awesome things about this one. Here we have two geeklists you should check. One line definition Operation Typhoon (WWII East Front 1941) with some tweaks. Hidden units, hidden objectives... but hidden to both! You will know the strength of a unit when you attack it and you will know the impact of your lost (or victory) when you suffer it. Months on the list: ??? According to Brian Youse in Special OPS 3 the game is done, waiting for its numbers. - Game scale: Units are divisions, turns are ten days, and hexes are 17.2 kilometers across. My unnecessary comments Japanese game, check. Adam Starkweather, check. Niko Eskubi, check. Now I only have to check my bank account. A few months ago user billyboy published some information on the game in this geeklist, go check it! Our friend Iain has a very nice AAR that you can check and that has skyrocketed this game. One line definition Area impulse game on the pacific. Why is it not popular? The Buzz: It is slated for the next batch, so hopefully after the summer. Slated for release, with others, I don't feel I can give a date! My unnecessary comments The designer is a pretty well known ASL players, but this time leaves the waters of ASL to try another tactical system in the Pacific. If IIRC the events covered in this game are portrayed in HBO's series The Pacific. I have three games on this topic (CC , TCS and ASL) not really interested. It would be cool if someone (or a group of people) reviewed the four games (or the 3 MMP's games). I suggested it for Battles Magazine and it would be cool, but finding someone to carry out the enterprise is a different matter! First game that has passed its goal and one of the oldest in the P500, still on the future for release. Appears in the short list of future non-ASL printings, that is all I can say. An excellent month for this game's standard. One line definition Another Area Impulse game on a rare subject. The french resistance against Vietnamese attack. One side effect of Lincoln's War is that we had an open slot for one deck of cards, so MMP made the decision to produce the cards for Storm Over Dien Bien Phu. You can still preorder this game, but we will be manufacturing it as soon as possible so that we don't have printed (and paid for) parts just sitting in our warehouse. So please, get your preorder in, save 25%, and we are sure you will enjoy this game! Dien Bien Phu is playable in 2-3 hours, follows historical narrative very well, is a very tense game, and is an undergamed topic. We will be sending out information on how this affects the "bundled with Storm Over Normandy" persons shortly, but if you have already preordered either the bundled version or the stand alone version we expect Dien Bien Phu to be out this year. Additional rules added to the game include sapping, assaulting, and the French supply situation. In addition to these new rules, new cards have been created in order to represent events encountered during the battle. These include “Detonate Mine Shaft”, “Rats of the Nam Yum”, “Giap Demands Success”, “Propoganda”, “Débouchez à Zéro!”, and “B-26 Bombers”. The game focuses on the attacks on the strongpoints of Gabrielle, Anne–Marie, Beatrice, Eliane, Claudine, Huguette and Dominique from mid–March to early May of 1953. The game is eight turn longs, and can easily be played in less than 3 hours by experienced players. This game is suffering from two main problems, a niche system in a niche battle. This is a really interesting battle that needs to be more gamed. It is interesting to see how it competes with its sister game to be the one with the higher number of preorders, although they will be certainly published together. I am currently being very restricted with my purchases, but this is one I am certainly considering. Fall's "Hell in a Very Small Place"
This game has stalled. In the last trimester it has received 0 new preorders, growing only with the bundle. We need more non-standard time period wargames! I hate the cover art that appears in MMP's website for this game, I hate it with a passion. A very good month for the game and it seems a natural game for MMP to try new "marketing" techniques with. An excellent month for this game with a total of 10 preorders. This is currently my most desired game to try. One line definitionA new series using variable combat values for units. The first game is on Salerno. Months on the list: Unknown. As it stands right now, there will be 2 smaller mapsheets. Charts added to both ends and just a little too long for a standard map to fit make this necessary. I had the playtest map joined and laminated and I have to tell you it rocks. The next correction is that there is an increased need for counters and another 1/2 sheet will be added. The playtesters were using the vassal set made for the purpose. The fact that there is no attacker and no defender in this fight takes a little adjustment. You are both throughout the game from turn 1 on through the end. I love the description by sgt maj Forrest Atterberry of our WBC game: "Every turn was a knife fight". Need big time preorders to make it this year. Brian backed me on this project and believes in it as a great MMP product. He has given me Nick Richardson and Nicolas Eskubi to make sure the series volume #1 gets the best possible treatment. I am also keeping close contact with Joe Balkoski on the progress. I also have his confidence that the similar theme isn't going to be ignored. Two more games using the system are being developed. You can download the rules in MMP's webpage! I am interested in seeing how this series turn out. The fact that you will not know the unit strength until it is tried is something quite unique and interesting. A similar (or the same) system by the designer is the game Iron Tide: Panzers in the Ardennes. The least interesting title for me. But I think it is going to be to many peoples liking. BTW, after this Kharkov. There was a pair of threads a few days ago about why Market Garden and Bulge were so popular in wargaming. My take? Americans winning with spectacular deeds (or, in the case of MG someone to blame for not reaching the objective). The italian campaign on the other hand... Well, here is your opportunity to better one who is being considered (see the forum thread) one of the worst american generals of all time! Loser of the month, four months running low. One line definition OCS in Korea. It is the reprint of a classic OCS game and I can't wait for it !! Korea!!!! Months on the list: 25 (added October 11) Passed its preorder goal on July 2013!! My unnecessary comments I want this game. I want this game. I want this game.... Probably THE introduction to the system (until RE is out). Every time I thnk about cutting down my gaming buys I remember this (and RE) and realize I just won't be able. The Forgotten War, Clay Blair. South to the Naktong, North to the Yalu, US Army Official History, Roy E Appleman. Ebb and Flow, US Army Official History, Billy C Mossman. The Sea War in Korea, Malcolm W Cagle and Frank A Manson. US Marine Operations in Korea, Vol I, US Marine Corps’ Official History, Lynn Montross and Nicholas A Canzona. The US Air Force in Korea, 1950-1953, US Air Force Histories, Robert F. Futrell. Ridgeway Duels for Korea, Roy E Appleman. Disaster in Korea, Roy E Appleman. The Korean War, Max Hastings. One line definition SCS game covering the whole end of the war in Europe from the West, and now from the East as well. The game is a 2nd edition, if you own the first one you can preorder simply the expansion. I am not differentiating the numbers as MMP does neither. NOTE: When the "previous owners" and "normal" preorders for TME2 add up to 550+ this game has "hit", they do NOT have to individually hit the 550 preorder. Players owning the original TME can preorder a reduced-cost preorder for this game on the honor system. Too much of the game changed to warrant an "upgrade kit". This option will only be available while the game is on preorder. The Mighty Endeavor was put on preorder March 6th, 2013. I have tentatively preordered this game. It looks so nice and SCS is so playable.... but at the end of the day I have doubts as I have It Never Snows unpunched! INSS still unpunched Well, this game rises 3 spots and it shooting for the stars! SCS is sooooo playable. One line definition Operation Exporter, in OCS, low counter density, but a lot of meat (including naval operations!) this is the introduction to OCS. It will include an OCS Guide!!!. Second best rising star of the month, it is going steady. I suppose that being able to pity both of history's two baddies -if you are spanish -, England and France against each other is a plus. You know you want to start playing OCS. You know you really want to. Here is where you are going to start. For all those already playing OCS, I don't need to say more. Is it out yet? Is it out yet? I want this game. I want this game. The Gamers Line of Battle System (a Regimental level system) take on Gettysburg. 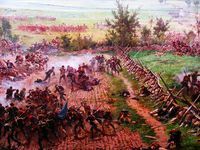 Last Chance for Victory is the next entry in The Gamers’ Line of Battle series (LoB) which simulates the Battle of Gettysburg. It is the second game in the series, following the well-received None but Heroes about the Battle of Antietam. The story of Gettysburg is well known or, I should say, the popular rendition of the battle is well known and has certainly been simulated multiple times. As is usually the case with stripped down, accepted versions of complex events, this narrative misses much flavor and deeper understanding of what went on. It’s the ‘auto-tour’ version of a much more involved event. Lee arrived on the field and tried to get his footing when Ewell (on his own initiative) ordered Rodes and Early to attack. Lee wasted no time in ordering Hill to attack with Heth and Pender to support Ewell’s Corps. In the commonly held view, Lee arrived and simply dithered while events unfolded outside his control. There were several opportunities that afternoon and evening to advance and take Cemetery and/or Culp’s Hills. These were missed… but not, as commonly assumed, because one or more leaders were staring at their navels confused or indecisive. What happened and why? Ewell made a clear headed decision his men were in no condition to take the hill that evening. He was the commander on the spot. Since then historians and armchair generals everywhere have questioned that decision, the game allows you to see who was right. Ewell was of the opinion that he could only do it if 3rd Corps supported him. That support was ordered by Lee (using 3rd Corps’ artillery) but was not implemented by the army’s chief of artillery. Would that have allowed the attack to work? What was the relative condition of the Union defenders and potential attacking troops anyway? There never was any sort of ‘dawn attack’ order, but there were orders to attack much earlier on the second day than actually occurred. The game allows you to find out what went wrong (so you can draw your own conclusions as to who to blame). By evening of the 2nd day, the fate of Cemetery Ridge rested in the hands of a handful of formed Union regiments (including the human sacrifice of the 1st Minnesota). Confederate victory was very, very close—teetering in the balance much more than normally assumed. There was a reason Lee said that if Dorsey Pender remained is command for another 30 minutes, the Confederates would have won the battle. See just how tough the Union job was and how close to the edge they got. What would have been the result of that Second Day’s attack had it launched just a few hours earlier or even at the same time, but with the coordinated use of Anderson’s and Pender’s divisions? Everyone assumes Pickett’s Charge was a forlorn, desparate, throw of the dice, but what was the condition of many of the Union units manning that ridge? Was this attack a complete reworking of the Confederate battle plan out of blind frustration or was it a continuation of the plan from both earlier days? What was the earlier, theoretically coordinated, plan the attack was ad libbed from? As a whole, the popular version of the battle pretty much assumes a Union victory unless multiple stars aligned for the Confederates. If this is so, did the Army of the Potomac have to merely put out a ‘fair-to-middl’in’ effort or did they have to fight tooth and nail to gain victory? If the latter, just how close of a run was it? Doesn’t “assuming they will win” take away well earned credit they had for finally overcoming a determined and usually successful foe? Last Chance for Victory attempts to allow players to find their own answers to these questions and points as well as many others. The added depth and nuance makes for a very different and, in my opinion, more accurate rendition of the battle than you’ve ever seen before. Aside from showing the history in a way that will be both entertaining but make you thirst for more and better reading on the topic, multiple variations are provided to explore the battle. Sure, there are the usual “extra troops” variants, but more importantly, options that allow players to tweak the various historical behavior ‘knobs’ I assigned. If you think my ‘setting’ for Howard (to pull a name out of a hat) are all wet, you can change him to be better (or worse) so you can see how your version ‘plays.’ Likewise, a number of rules simulate activities that were pretty much out of the players hands (such as Buford’s need to screen the town yet keep his losses very low), these can be ‘turned off’ as desired to see what effect they really have on the battle. There is a matrix of the various ‘control’ rules and the possible ‘settings’ for each one that players can use before starting if they disagree with my decisions. The results of your choices might surprise you and spur your understanding of the battle to new levels. As with None but Heroes, Last Chance for Victory is designed to bring all of this and much more to your table in the most historically accurate and informationally jam-packed game possible. Like any LoB game, it was designed with twin goals: the most insight possible and a game with maximum playability. Enhancing the already popularly received and streamlined Line of Battle rules, Last Chance for Victory comes with the v2.0 series rules. These rules incorporate the refinements and suggestions of hundreds of real players which make the smooth system even faster to play. Make no mistake, this is the only regimental level Gettysburg game that can be played to completion at a respectable clip—yet it is a large game. A pair of reasonably fast players could play the campaign game to completion at a convention like ConsimExpo. I’ve completed campaign games with three players in a week of rather relaxed play time. Scenarios abound of various sizes. The campaign uses a 4-map ‘box’ layout, but the game comes with two additional maps, one covering just the 1st Day’s fighting and the other the 2nd and 3rd Day’s. The big game scenarios can be played on one or both of those maps plus, with those two linked together, it is possible to play the entire battle on 2 maps. 22 Scenarios… with up two three size variations each, one of which is one map for each! I tried hard to fight the tentation but couldn't. I will never play the whole campaign but I think I might try one or two scenarios... solitaire bien sûr. This is probably the most "impulse" of all my buys. I shouldn't have done. Really. I shouldn't. But once I've done it... where it is? I need it! - OCS Beyond the Rhine. Same place as TBL but different timeframe. This time is the Germans running backwards.Rumor has it that the campaign game is well along, but the scenarios are not yet ready. New playtest photos posted on CSW. - OCS Italy. Too far away, but still in the works. Rumors speak of a 3.5 mile per hex map, for a three mapper. - OCS Crimea. After some time without news some CSW post said that this game was still in the works as a one mapper "introductory" game to the system. Anyone has information on this? Is this dead after Reluctant Enemies appeared? - Pacific War Reprint. Mark Herman has said that he is working on it so...Mentioned as upcoming in Special OPS 3.Mark Herman hinted something in the latest C3i (or am I confusing something? - Victory...Deferred? After AVL and AVD, the milking of the system is just natural. - The Rise and Fall of the Galactic Empire. ???? - ASL SK#4 Pacific. Probably once Rising Sun is out we will have more news on this one. This one was supposed to be ready at the same time as Rising Sun, no? - ASL Sealion. Counterfactual ASL module. You want to kick a hornest nest? Go to CSW and celebrate this module! - Monty's Gamble: Market Garden. - Lots of rumors on the TCS front, but first CC must be out. - Operation Brevity and Battleaxe for GTS. Apparently being showed off in Winter Offensive. - GTS Crete. You read it first here! -GTS Tinian. You read it first here! - ON GCACW, the Atlanta Campaign should be the next up. - BCS A Time For Trumpets. A Bulge game using Dean Essig's lattest system. This guy is going to ruin me. - BCS Velikie Luki. Because Dean knows he can ruin me quicker if he gets two games out at the same time. Thanks for taking the time in reading! October was a bad month, and I think it is something like the fourth in a row I say so. I am starting to get really tired. But, I had a gaming goal. I was going to have 2 full days of gaming with friends this weekend. It was a surprised for them as they didn't expect me to go. Alas, I won't be able to go. My grandmother (aged 99 and really sick for the last 4 years) passed away this morning. Well, she had a long, prosperous and happy live and it is time for us to say farewell to her. On the gaming front, my wife gave me as anniversary gift Duel of Ages II plus all the expansions. I managed to get a game in with Enrique and I have played three or four short games solitaire. Also I have gone through the solitaire example of play of Cuba Libre and Navajo Wars. On the "vassal front". Our friend Wolfgang and I were going to start a game of Crusade and Revolution (check out the names at the back... I am on a rulebook!) but I think that both of us have been smacked cold on our ground. Lets hope for a better November.